The Education programme was the first which RLEK initiated with the Van Gujjar community. Adopting a non-conventional approach the organization started with an adult literacy programme in contrast to traditional approaches which generally put children first. RLEK maintains that children’s education programmes can only be sustained if adults realize its importance. The benefit of literacy was all-pervasive and had a key role to play – even in their pastoral lifestyle. RLEK volunteers travel with the tribe from the depths of the Rajaji National Park at the foothills of the Shivalik to the snow-clad mountains of Garhwal during their transmigratory cycle to continue the education programmes. These programmes are unique as volunteers adapt themselves to the Gujjar lifestyle and there is no disruption of teaching during migration.21,000 Van Gujjars have already attained literacy.Literacy and education have helped them in their traditional livelihood activities and now, create fresh opportunities for the Gujjars. Some of them have attended seminars on conservation of environment at Brazil, Sweden and Denmark. Further, it has created the demand for children’s education, paved the way for their voting rights and rights against illegal eviction from the forest. For this unique and innovative endeavour of RLEK, the prestigious first NLM – UNESCO Award in 1998 and the Rotary International Awards for Service to Humanity for RLEK’s Innovative Education Programme for the Van Gujjars in 1998 was bestowed on the organization. Another positive fall-out of the intervention being that the community has now been getting a good price for their produce i.e. milk as they have formed milk co-operatives this has also eliminated the role of middle men and the Van Gujjars are getting the requisite price for their produce which was absent earlier. Van Gujjars have an intense emotional attachment to their buffalo herds because the sale of milk from the buffalo is their livelihood. In the past, middlemen would make large profits at the expense of this community even ‘bonding’ Van Gujjars through loans with very high interest. RLEK assisted Van Gujjar Self Help Groups by organising a milk cooperative. Through (limited) purchase and reselling of milk in urban areas RLEK established a base procurement price, which other middlemen have, perforce, had to meet. This positive market intervention, increased returns to the Van Gujjars manifold. Since the community understood the importance of education another positive fallout was that the adult education programme created the demand for children’s education. The Women self help groups (SHG) are entrusted with the responsibility of monitoring & managing the functioning of the school An education committee under the supervision of the women SHG is formed with representatives from the elected local self governance institute, parents of the children and the organization for facilitating the process. To ensure Transparency, the community is involved in the early stages on project need, design, implementation and management of school. Minimum 50% admission is given to the girl child to ensure gender equity in school education. Libraries are maintained for the school children as well as for the neo-literates in the community. To combat absenteeism amongst teachers in these far flung, inaccessible areas a special provision of room for the teacher is made in the school premises. Children belonging to the Below Poverty Line (BPL) groups and freed bonded laborers are totally exempted from paying the fees. Teachers Training Programme- English as a subject has been recently introduced from grade I in the state of Uttarakhand, RLEK realized the emergent need to build the capacities of the RLEK schools teachers in reading, writing and spoken English. Each year a team of voluntary English teachers from Ireland, England and Scotland impart enriching and stimulating trainings that include reading schemes, games, role plays, poems, exercises, song and much more. Library Management Trainings have also been imparted to the teachers, not only to manage the libraries, but also inculcate amongst the children light and informative reading. Although women could use literacy to increase their access to new knowledge, most Adult Literacy programs do not go beyond the concept of numeracy and Alphabetization, which does not have many takers. It is important to see that literacy addresses the current need of the people that enhances and compliments their livelihood and immediate survival & sustenance. To facilitate the SHGs and collectives in attaining different competencies and thus move towards self-sustenance and self-reliance, RLEK has successfully converged Adult Education with Functional Literacy amongst these groups. 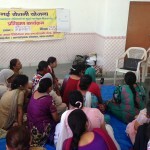 The Idea behind the Innovative – Functional Literacy for the Self Help Groups is to endow the members of the SHGs with skills, vision one hand, and to imbibe in them the literacy skill with skill enhancement towards account keeping, record maintenance, manage, plan and administer livelihood activities undertaken by them effectively with a Rights Based Approach.